We're now less than a month away from the 71 Cannes Film Festival kicking off, so the festival has revealed their official poster art. I have a tradition of always writing about this here, because they always choosing some very appealing, eye-catching art and this year that is for sure the case. The image use in the poster / official art is from Jean-Luc Godard's Pierrot le fou, which originally premiered at the Venice and London Film Festivals in 1965. The shot shows Jean-Paul Belmondo and Anna Karina kissing across two cars, and it's quite lovely and evocative and eye-catching, indeed. Honestly this art is kind of perfect, at least making it feel attractive again. I'm looking forward to the festival, which kicks off early on Tuesday, May 8th this year. Check out the official poster below and stick around for the official selection reveal this week, too. Images and info all directly from Cannes. 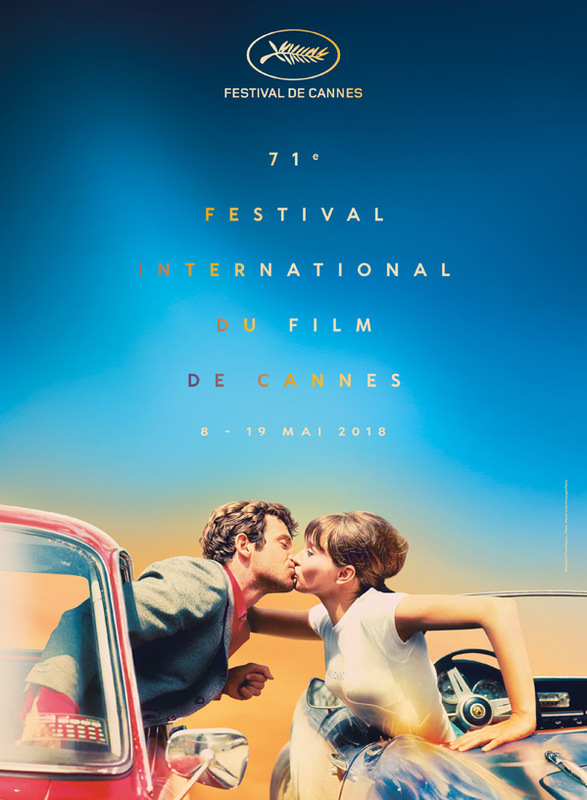 "The poster of the 71st Festival de Cannes, taken from Jean-Luc Godard's Pierrot le fou (1965), is inspired by the work of Georges Pierre (1927-2003). This immense still photographer immortalised the shooting of over a hundred films in a 30-year career that began in 1960 with Jacques Rivette, Alain Resnais and Louis Malle. He then worked in partnership with Robert Enrico, Yves Robert, Claude Sautet, Bertrand Tavernier, Andrzej Zulawski, Andrzej Wajda, and of course Jean-Luc Godard. Committed to achieving recognition for stills photographers as artists in their own right, Georges Pierre founded the Association des Photographes de Films, tasked with defending the material and moral interests of cinema photographers." The poster itself is the work of graphic designer Flore Maquin. Cannes runs from May 8th - May 19th next month in the South of France - more on their website. We'll be there.